Jewish Humor Central: Take Me Out To The Ball Game: It's A Jewish Song! Take Me Out To The Ball Game: It's A Jewish Song! Well, the composer of the music was Jewish. The lyricist was Episcopalian. 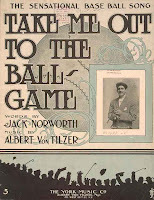 The baseball classic, sung during the seventh inning in most stadiums around the country, was written in 1908 by lyricist Jack Norworth and composer Albert Von Tilzer. 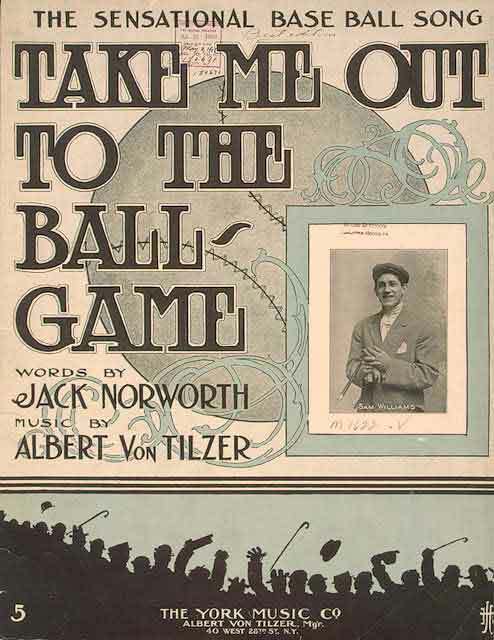 Books for adults and for children have been written about this song, including Baseball's Greatest Hit: The Story of "Take Me Out to the Ball Game", a 222 page history of the song by Robert Thompson, published on its 100th anniversary in 2008. In the book, more details are revealed about Von Tilzer, who was a shoe salesman in his father Jacob Gumm's store in Indianapolis before joining his brothers in songwriting. Albert's brother Harry was the most successful of the five in the music world, and claimed to be the creator of the term "Tin Pan Alley" to describe the block of 28th Street between Broadway and Sixth Avenue, where the tinny sound of pianos signaled the place where most music was written at the time. Here is one of the first recordings of the song, with the original lyrics sung by Edward Meeker in 1908. Enjoy!